Our corespondent Su, in Great Britain, is unrelated by blood but decidedly related by research, not to mention a mutual bizarre love of tangential information (sound familiar?) which actually makes her more related than YOU. Read on, this is delightful! I have a relative who does voluntary work in a Charity /Thrift shop where she sorts the incoming book donations. She has to judge what is worth putting on sale and make some sort of guess as to how it should be priced. Occasionally she finds old, unusual or foreign books and she has to do a little research on Amazon and other book dealers to find out what sort of price the charity might be able to get for them. Occasionally she gets stumped so she sends her problems to me. The first time this happened it was a book printed in German Black Letter Gothic, or Fraktur and I’m reasonably capable at reading that because of my translations of cousin Joe’s Heimatskunde. The most recent one is the best yet and to help me she sent me some photos of it that she’d taken on her phone. 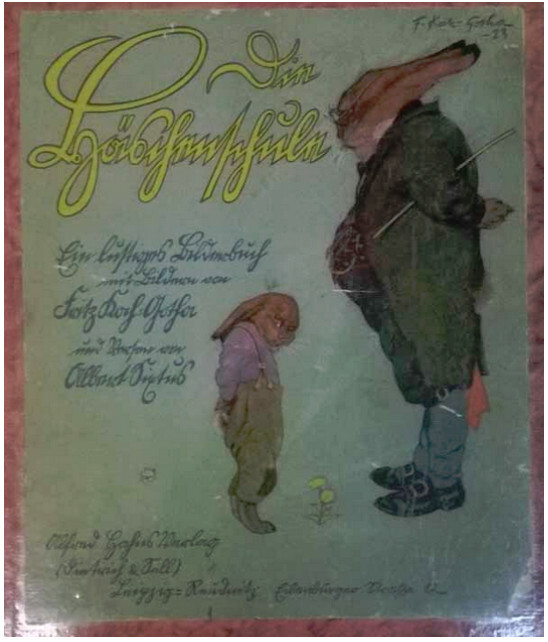 It was a tiny children’s pictorial storybook (see right) in the German Language and what caused the problem was that the cover was printed not in Fraktur but Sütterlin! 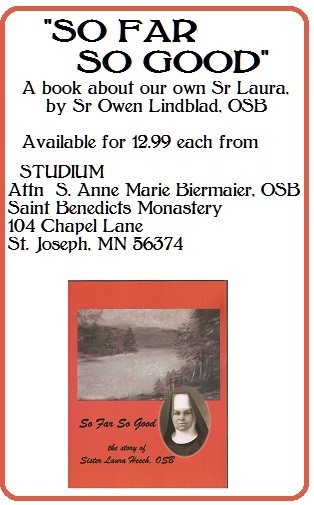 Now who would have thought that my limited ability to read Sütterlin could have any use outside our particular obscure branch of family history? I’ve only ever come across Sütterlin as a cursive script before and the font used on the front cover was a version designed to look like handwriting. “Die Häschenschule Ein lustiges Bilderbuch mit Bilden von Fritz Koch-Gotha und Versen von Albert Sixtus” was translated by Googletranslate as “The Rabbit School: A Funny Picture Book with pictures from Fritz Koch Gotha and verses from Albert Sixtus”. I was intrigued to find out more about it. 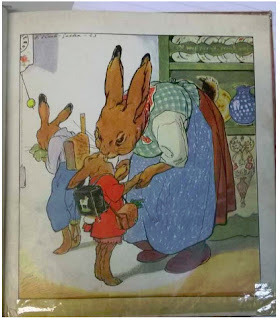 This little book seems to be as deeply embedded in the German culture, social memory and affection as Beatrix Potter’s stories of Peter Rabbit are in England (and possibly the US? – I don’t know what is your equivalent – maybe The Cat in the Hat?). It has been in print almost continuously since it was first published in 1924 and it became clear through visiting many German book-dealer sites that although there are hundreds of copies of various ages around, like Peter Rabbit, an early edition could be quite valuable, so it was important that I could date it reasonably accurately. I spent a lot of time on time on it and began to get a feel for what was important in determining its age. It isn’t one of the very earliest editions because the cover background is pale, not dark, and that change was made in after the 6th edition but it must have been printed before 1947 when the stern teacher rabbit was deprived of his cane because he was thought to be too scary. After that, narrowing down the date depended on what font was used for the body text and here things began to get really interesting. The changes in the typeface used for the body text of this book, over the time it has been published reflect some very interesting cultural and social issues in Germany. The early editions had the text printed in Fraktur, a gothic font beloved of German speaking peoples and others, but in the mid 1930s it was reprinted in Antiqua, which is a Roman or Latin font, like the one I’m typing in now, and from the 51st edition it was printed in Sütterlin but there is a great deal more behind this than you could possibly imagine. The use of Gothic style scripts was once widespread across Europe but from the 18th century slowly gave way Latin style scripts, which were considered to be of the classical age. In the early 19th century, when Germany was establishing itself as a nation and its cultural identity was of great significance, Fraktur was adopted as the official national typeface. Despite this, there was much intellectual discussion about whether it was in fact the best sort of font to use. Some thought that it would be better to use a Latin /Roman style of lettering called Antiqua, such as we use in the US and UK; others thought they should continue with Fraktur because it represented German virtues such as depth and sobriety (!). The argument over the various virtues of the fonts descended into a vitriolic silliness that it is hard to believe and became known as the Antiqua – Fractur dispute . Otto von Bismarck was so much against the use of Antiqua that he returned gifts of books printed in Antiqua with a note to say that he ‘didn’t read German books in Latin letters’! The great poet Goethe was attracted to the clarity and easy reading qualities of Antiqua but his mother was definitely not, and wrote to urge him to remain—"for God's sake"—German, even in his letters. Until 1911 most German printed material was in Fraktur and German handwriting was in a cursive script called Kurrent but a further complexity arose when in that year the Prussian Ministry of Science, Art and Culture (Preußisches Ministerium für Wissenschaft, Kunst und Volksbildung) commissioned the graphic artist Ludwig Sütterlin, to create a modern, more easily readable handwriting script and an equivalent print font. Thus Sütterlinschrift became the accepted style of handwriting in Prussia in 1915, that gradually spread across Germany until by 1935 it was the only style taught. Despite later changes in policy it was still being taught in some places as late as the 1970s. If you compare examples of Sütterlin you can see that Sütterlin is a more upright, print-like version of Kurrent that has been shorn of its smooth flowing qualities for the virtue of modern style and readability. I suspect that although these changes have made Sütterlin a little easier to read it is probably much more difficult to write clearly at speed than Kurrent so, in general, people who were taught the new modern fashionable style had handwriting that was of poorer quality than those taught Kurrent. I’m making this suggestion through personal experience because I was taught a version of English handwriting called Marion Richardson Writing. Letters were very simple with no serifs, loops or ornaments of any kind; even the capital letter J did not have a horizontal line on it. Each letter had to be perfectly vertical and there were very few ligatures between letters. It meant that there was no natural flow to it and it was tiring to write as the pen had to be lifted off the page very frequently. I was considered to have very good handwriting at Junior School but as my education progressed the need to write both quickly and clearly became more pressing and I hadn’t been taught the methods that enabled me to do it. To my shame, as an adult, I don’t have the good clear handwriting I should have and every adult I have ever met who was taught that method has complained of the same problem. To return to the great text saga. At first the Nazis embraced Fractur fonts for their supposed Germanic qualities but they tied themselves in knots over whether or not the font was ‘Jewish’ and in 1941 black letter typefaces such as Fraktur were banned in favour of Antiqua. Soon after, a second edict banned Sütterlin and Kurrent handwriting in favour of Normalschrift ("normal script"). 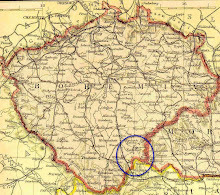 The edicts were signed by Martin Bormann but were probably made at the personal behest of Hitler himself, who in 1934 declared that an age of ‘steel and iron, glass and concrete’ required something more modern. It is also possible that in 1941, when the Nazis were still in the ascendant, they faced the problem of producing written material that could be read by people of the countries they had Occupied. Whatever an edict says, it is very difficult to erase a style of handwriting from the whole population so, although Sütterlin and Kurrent were no longer taught, they remained in use for many years afterwards and Sütterlin enjoyed a certain amount of revival after the fall of the Third Reich. The various fonts in which The Rabbit School was printed reflect these changes of policy, it being printed in Fraktur up till the mid 1930s, then Antiqua and later still in Sütterlin but I don’t know when it finally returned to a Latin style font. The edition I had to deal with was curious in that the outer cover (probably the damaged dust jacket that had been cut down and attached to the book with sticky-backed plastic at a much later date) was in Sütterlin but the body text was in Fraktur. Dust jackets are easy and cheap to change so it may have been old stock given a quick makeover to make it more appealing and saleable. When I do a piece of work like this I write a mini-report of my findings and keep a careful note of the websites I’ve used, the translations I’ve made and where I’ve sourced other information just in case the information is needed again. Yes- very pedantic of me but this is about good research practice. I worked on it nearly all day, stopped typing and closed the document and went off to cook the evening meal. When I returned to it a little later –Oh no! - all that opened was the earliest page in which was pasted the screen shots of the photos and even Rob, with all is skills and tricks, couldn’t resurrect the version I’d been working on. I am very careful about ‘frequent saving stops you raving’ and we also have an auto-save facility set up to operate at ten-minute intervals but somehow that had failed too but in the end this wasn’t quite the disaster it seemed at the time. Overnight I mulled over the problems and in the back of my mind was a deep unease. There was something odd that I couldn’t put my finger on and it concerned both the translation and the illustrations. 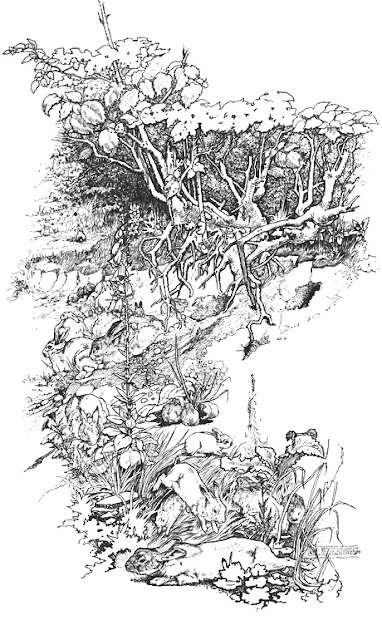 The pictures in Beatrix Potter’s books are very charming but they are not fictionalized animals: Peter, despite his little blue jacket is a real rabbit. Potter kept wild animals of all sorts as pets and she was a very skilled and accurate painter who worked from life. What bothered me about the rabbits in the pictures in The Rabbit School was that they didn’t really look like rabbits to me. Wild rabbits are a bit chubby and fluffy and genuinely very appealing but the rabbits in this book are slim; their heads are bony, their paws are long and delicate and there is something wrong about the ears. The next morning I sat down at the computer and tied to recreate the previous day’s work but first I looked very carefully at the pictures and the text and it suddenly hit me that the German word for rabbit is das Kaninchen but that word doesn’t occur in the title. I wondered if the word used was German for ‘bunny ‘rather than ‘rabbit’ and suspicious of google translate I tried dear Herman instead. And Herman spoke and he said that Die Häschenschule is not The Rabbit School but The Leverets School and a leveret is a young hare! Immediately I knew what it was that had disturbed me about the illustrations: they are very accurate paintings of hares, not rabbits. In North America there are something like 15 species of rabbits and hares but in Britain and across most of Europe there are only three. We have Rabbits, Mountain or Blue Hares and Brown Hares, but Mountain Hares mostly live only in the higher uplands and I don’t think I’ve ever seen one. Most people who do not live in the countryside can’t tell them apart, but to me, hares and rabbits are as different a Thoroughbred English racehorse is from a tubby Shetland pony. Fritz Koch Gotha meticulously recorded their exact features in his illustrations: hares are slim, long legged, with very distinct black tips to their ears and black fur on the upper sides of their elegant, white, tails. They also have golden brown irises to their eyes whereas rabbits’ eyes are just very dark – almost black. Hares are far less common than rabbits and hold a special place in British folklore, being considered fey and magic and wise, and the Easter Bunny is really the Easter Hare. Am I the only person to have noticed this mistake in translation? I went back through the examples for sale on English–language sites and all except one called it The Rabbit School. That odd one, which was advertised under its German title, described the cover illustration as having a ‘hare headmaster and leveret pupil’. You can now be laugh hysterically at my expense, when I tell you that having thought I’d got it wrapped, I discovered that German translations of The Tale of Peter Rabbit is published as Die Geschichte von Peterchen Hase. The –chen ending is a diminutive which can imply cuteness, but the Hase is an adult hare! There is the possibility that the publishers were jumping on the bandwagon of the undoubted popularity of Die Häschenschule but it is equally likely I’m missing some subtle cultural detail. ARGGHH Translation is truly a minefield! Rabbits are not native to Britain but were introduced by the Norman French about 1000 years ago as a very special and luxurious form of food for the tables of the rich. They were kept in specially built ‘warrens’ surrounded by a wall and looked after by a warrener who ran a pack of dogs for culling them. At that time the adult was called a Cony or Coney, the young were called rabbits and the babies called kits. The Norman French and the later Medieval Court and aristocracy was besotted with hunting, and cooking and eating their kill and they had an enormous and highly complicated vocabulary of words associated with these activities. Even the process of dismembering the cooked carcass and serving the meat had a specific name dependent on the type of animal or bird. I think the reason that the word rabbit has survived while coney has gradually dropped out of use is that the rabbit is the only one that’s worth eating. Rob once shot a very large elderly rabbit (truly a coney) and we anticipated that it would feed us for several days, but after 8 hrs very slow and gentle cooking it was as tough as old boots and completely inedible. Since then we’ve never bothered to attempt to eat the coneys; it’s the rabbits we want. And yes, this is where Coney Island comes from (Rabbit Island). A hug and a THANK YOU to Su! !